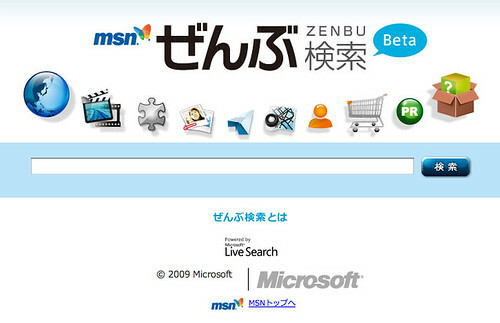 Bill at WebmasterWorld found a new MSN Japan search engine named Zenbu Kensaku at http://zenbu.jp.msn.com/. This new search engine beta actually will work with a lot of English keyword searches in addition to the Japanese. Enter a keyword and give it a try. The tabs at the top offer a number of ways to break down the SERPs. The default is to show all of the different categories together on one page "zenbu". Then we have web, Q&A, images, movies, news, maps, shopping, and sponsors. I've run through several searches, and it looks like a useful way to break down the SERPs. Could this be part of the MS Kumo beta? Common to Asian based search engines, the interface is very graphical. I decided to try searching for the word privacy in Japanese and I took a screen capture of the very interesting search results layout. You can see a screen capture of it at my Flickr account. This is clearly powered by Live Search, but the big question is, might this be a preview of Kumo in Japan? I doubt it is what we would see in the US when Kumo launches. Previous story: Yahoo Directory Renewals Going Completely Free?